The armillary is constructed of stainless steel with rings approximately 34 inches in diameter. The equatorial ring is a 3-inch band with 1-inch cast bronze Arabic hour numbers showing standard time and 1/2 inch cast bronze numbers for Daylight Saving Time. The other rings are unconventional. Rather than a horizontal ring, the ring is canted to match the latitude. The solstial ring that traditionally runs completely over the N-S vertical meridian is only 3/4 complete, creating an open area from the upper portion of the equatorial band to the southern pole that allows better viewing of the equatorial time ring when standing behind the armillary. The dial can be adjusted for the equation of time by rotating the equatorial ring to align on a plate with month marks set to the equation of time plus longitude offset, allowing the sundial to tell civil time. 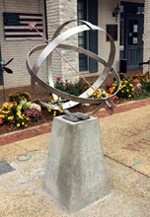 This armillary sundial is donated by Jim Corley, Dr. Seth Scott and the American Tank and Vessel Co. to the City of Lucedale. see the photo below for the complete inscription.